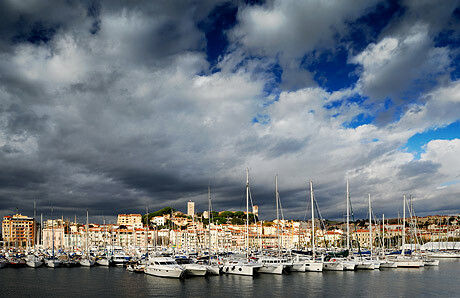 Together with the famous Le Suquet, the Cannes Port (Vieux Port) represents the oldest part of the city. The Port is located south eastwards as compared to Le Suquet, and it is easily accessible from the Allées de la Liberté. Thus, the Port is a good starting point for exploring both the Old City Center and the landmarks spread along the Allées de la Liberté, such as the Town Hall (Hôtel de Ville) and the numerous shopping opportunities brought forward by this street. The Port hosts the so called Gare Maritime (Marine Railway Station), and it also makes available almost 800 berths. In addition, the Cannes Port offers a taste of the luxury display of yachts owned by the rich and famous, the climax of this picture residing in the nearby coast of Antibes, where the International Yacht Club is located. At the same time, the Port also enables boat trips along the famous French Riviera coast, or ferryboat excursions to the nearby Lérins Islands (Îles de Lérins) where further attractions are opened to the large public interested in ticking off the landmarks which make Cannes live up to its fame – such as the Maritime Museum (Musée de la Mer). The liveliness of the Cannes Port is emphasized during the few events which count as some of the most spectacular happenings in the entire city. Thus, the Cannes International Boat and Yacht Show – also referred to as the Festival International de la Plaisance – is more than inviting for the enthusiasts of such vessels, given that luxury and glamor yield the main rules of the event. This event is held in September, a month which proves to be pretty busy for the Old Port, since another event also takes place this moment of the year, namely, the Salon de l’Automobile. The Fireworks Festival (or the Festival d’Art Pyrotechnique) is yet another happening which is hardly looked forward by both locals and tourists, taking into consideration the about 200,000 visitors attending the splendid six fireworks displays of which the festival consists. The bottom line is the Cannes Port, as old as it may be, is an actual core of bustle and effervescence, which is a great formula for keeping tourists busy and the city of Cannes proud of its attractions.